Vanilla extract is just one of those ingredients you can not compromise quality on. If you want that pure robust aromatic vanilla taste, then go with the real stuff. If you open up that bottle and you don’t smell the most glorious smell, throw it out! Make sure you keep the real stuff in a cool dark place, away from harmful sunlight. Vanilla extract is definitely something I want to try making on my own eventually with quality Madagascar vanilla beans and pure vodka, but until then, J.R. Watkins will always be the only vanilla you’ll find in my pantry! And here are a few fun facts on learned on the Watkins website! “A delectable addition to dessert recipes, vanilla isn’t just for the kitchen. Use it to freshen potpourri or remove odors from microwaves, fridges and coolers. You can add a little bit of vanilla to paint to minimize the smell, and you can even keep insects away by mixing a teaspoon of vanilla with 1 cup of water and spraying it on your skin. (Bugs hate the scent! )” Ah, so I may have to use some vanilla when I sit outside to keep those damn summer bugs away 😉 Good to know! Besides the fact that I think my Madagascar Bourbon Vanilla Extract is fancy, I also think this granola is extra fancy because I hoped on the raw quinoa theme. That’s right, there is uncooked quinoa seeds in there! As well as quinoa flakes! When I started seeing so many great granola recipes using quinoa, I knew I had to try my own too. I absolutely loved the fresh clean quinoa taste the granola had. 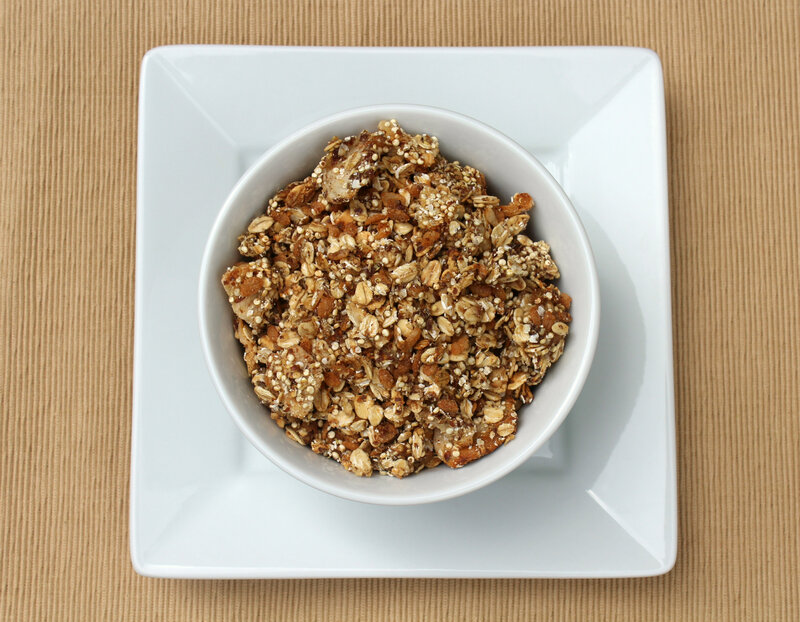 It worked really well with this subtly sweet vanilla pear granola. As for the pear, I had a different pear granola flavor combo in my head, but then when I really started thinking about it, it just didn’t sound as appealing anymore. So I used the pear in this recipe instead. Plus, pears are pretty fancy too right? I mean people get those special Harry and David Pear boxes for Christmas. Yea, pears aren’t exactly summer fruit either, but I digress! 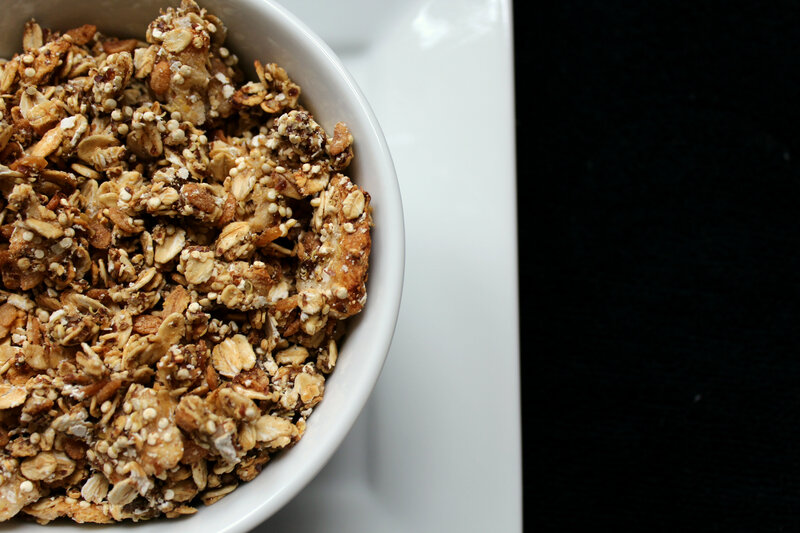 When it comes to granola, there are no seasons, there are no restraints, there is just glorious deliciousness! + Preheat the oven to 325°F. + In a large bowl, combine oats, cereal, quinoa, quinoa flakes, flax, and dried pear. Mix well. Then add the remaining ingredients and mix well so everything is mingled together and thoroughly distributed. + Line a baking pan with parchment paper, or an oiled piece of foil. Evenly spread the granola out on the pan and pop it in the oven. Bake for 25-30 minutes, stirring every 10 minutes. + Remove from the oven when done and let cool completely before storing in an air tight container or glass jar. + Is there a certain ingredients you will never compromise the quality on? Vanilla extract is definitely one of mine, as well as cinnamon, and nut butters. Happy granola-ing my foodie friends! what can I use instead of stevia ? Can I omit or replace with a little honey or coconut sugar ? You can, but that’s up to you. Love this flavor pairing. There’s no substitute for real vanilla. I’m not familiar with quinoa flakes but will search them out. Looking forward to trying this. Quinoa flakes will rock your foodie world! You will love them! only real vanilla in this house! I think I have everything to make this, sounds so good! thank you! Yes! Real is the ONLY way to go! 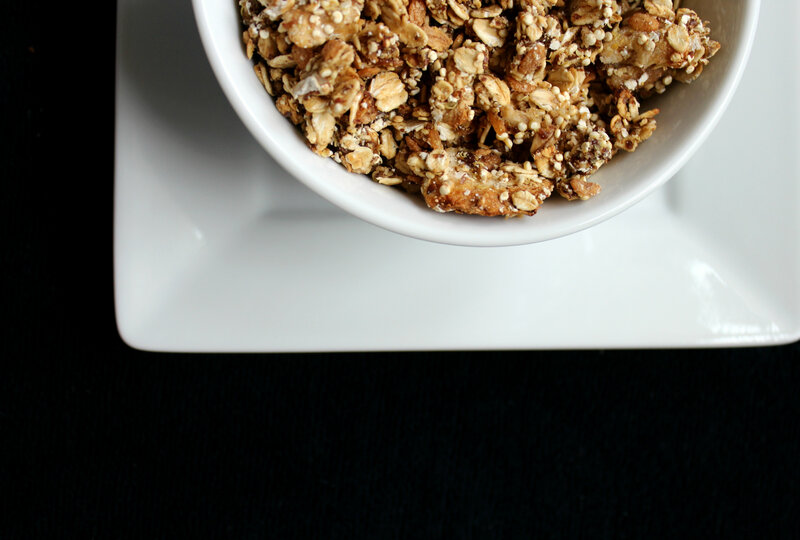 I love granola, but it always seems like there is only so much you can do with it – you’ve really gotten creative with the textures in this one – too awesome! No way! 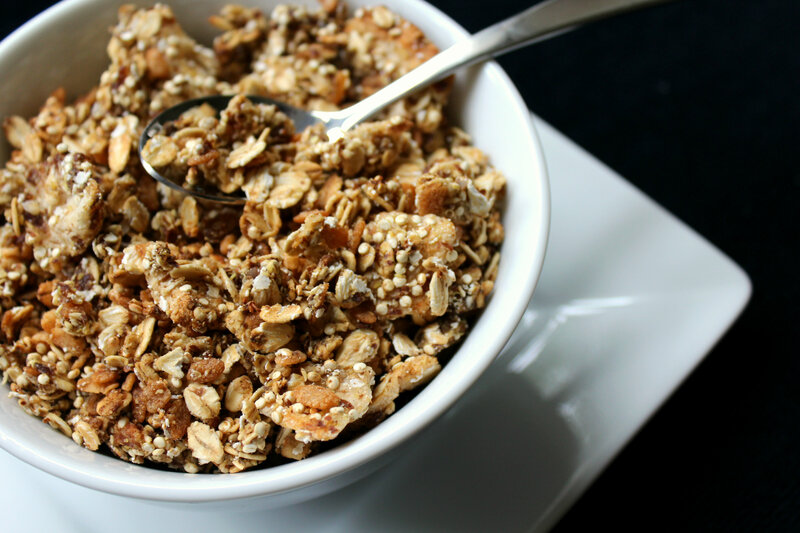 There is SO much you can do with granola! Oh wow, looks SO good! I’m a huge fan of home made granola. So much better than store bought! I’d never seen freeze dried pears though – so cool! Granola is my life! I don’t think I will ever go back to buying store bought ever! Homemade is so much better! Your granola sounds delicious! Real vanilla is so much better than the fake stuff! Thanks girl! And yes…yes it is! Love it! I am all about anything with pear in it! Oh man… I haven’t had a big bowl of cereal since I went gluten-free. This looks so good! I would especially love to eat this after a long run… mmm cereal. Thanks so much for sharing this with us at Healthy Vegan Fridays. I have Pinned your recipe to our Pinterest Page. 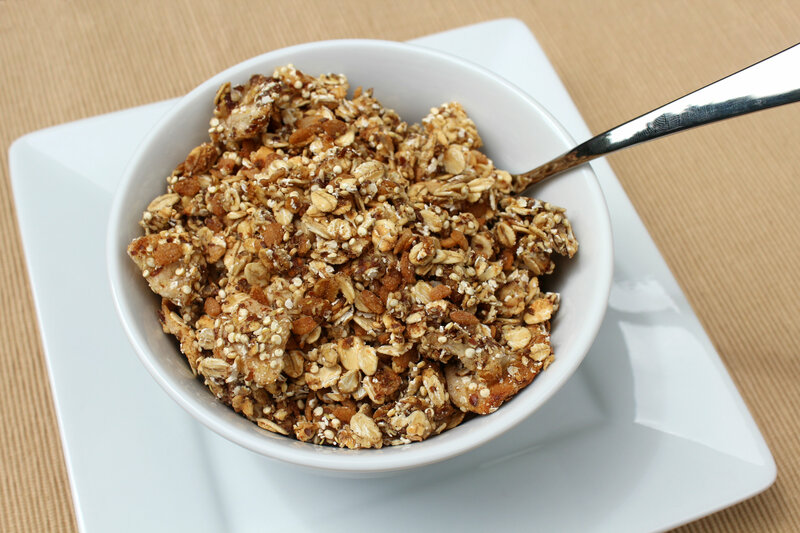 Great idea combining quinoa with granola…terrific way to add protein. Pinned. This looks so yummy! I make my own vanilla extract, last time I used madagascar beans! Yea! That is the way to go! I want to make my own so bad! This looks delicious. Thanks so much for sharing with the Let’s Get Real Party. We are starting a Facebook group for Let’s Get Real bloggers as a place where we can get to know each other a bit better and support each other’s blogs. We would love to have you join. If you’re interested, please send the email address for your personal FB page (we aren’t able to add people from their blog pages) to me at gc @ calmhealthysexy.com and I will send you an invitation to the group. Looks and sounds delicious! 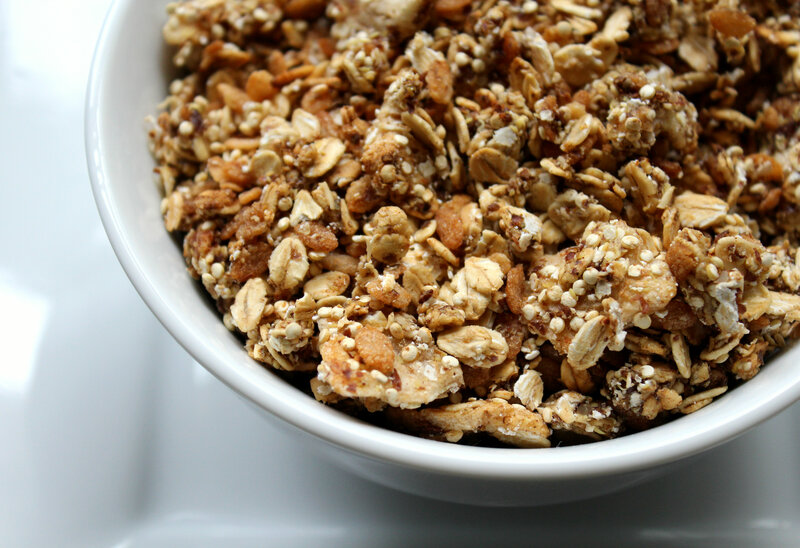 I love granola, especially recipes that are not your typical ones. 🙂 Thanks for sharing on Gluten-Free Wednesdays with us all! Thanks so much for stopping by at the Tasty Tuesday linkup party today! Love that recipe. Definitely pinning for later! Looks so delicious! Can’t wait to try this! Thank you so much for linking up at Tasty Tuesday! Your recipe has been pinned to the Tasty Tuesday Pinterest board! Please join us again this week! This looks amazing. I never would have thought to put quinoa in granola. Thanks for sharing with Pin Your Friday Favorite! Haha, its a really common ingredient everyone is using for granolas now! This sounds delicious. I love the addition of the pear. Thanks for sharing with Foodie Friends Friday. Great recipe. I always use the Real Vanilla Extract too. I didn’t know that Vanilla extract is a bug repellant – thanks for that tips and for sharing with Real Food Fridays. Haha I did not either! I love quinoa! 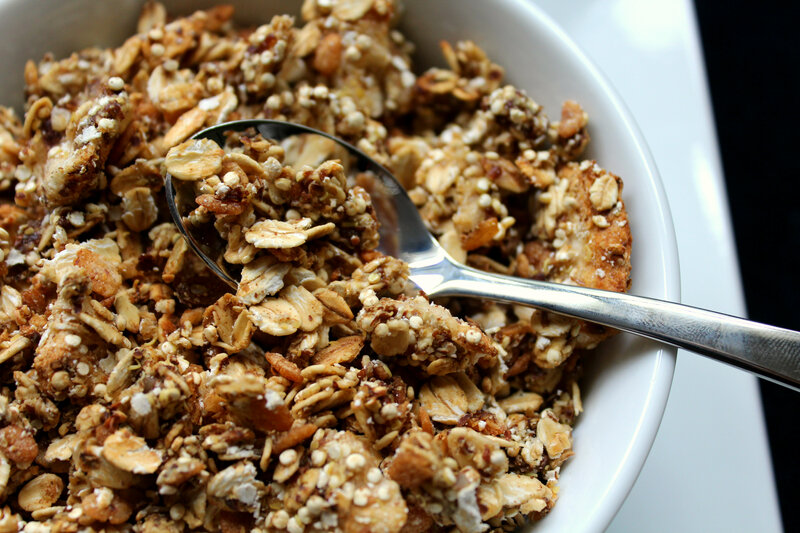 Have never seen it with granola before– Will definitely have to try this! Thanks for sharing! Pinned! It so good! you really get the quinoa taste and it is only subtly sweet! I never use artificial vanilla. We used to get our vanilla from Haiti and Mexico when relatives brought it back for us. That’s fabulous! Have you ever made your own? Never tried freeze dried pears, thanks for the recipe! add me to the list of those who have never made granola, but i have a bunch of oats ready and waiting. this looks so delicious! AH! Get on that stat! You will not be sorry! 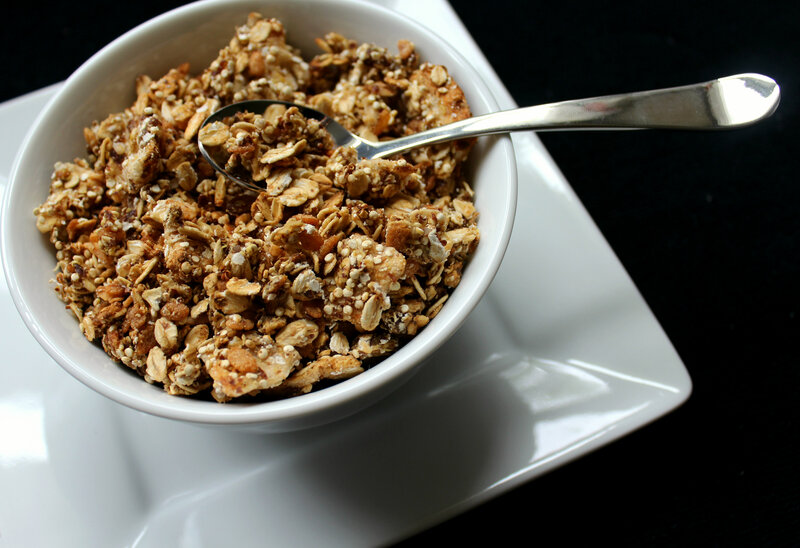 Homemade granola is one of my favorite things to make and it is just so so so good! Would you believe I’ve never made granola before? the shame….. This. Looks. Amazing! gotta try this with my yogurt ASAP! I love fruit purees (specifically baby food!) It comes in handy all the time! And freeze dried is perfect for that extra crispy bite! It is so easy to make though and so quick! Although it seems like when your waiting for it to finish in the oven…it smells so good! Freeze Dried is the best! I always use it in my granolas! It is perfectly crispy and keeps so much longer! Oh my goodness … this sounds wonderful! I must make up a batch for breakfast next week! And I only use REAL vanilla extract too! 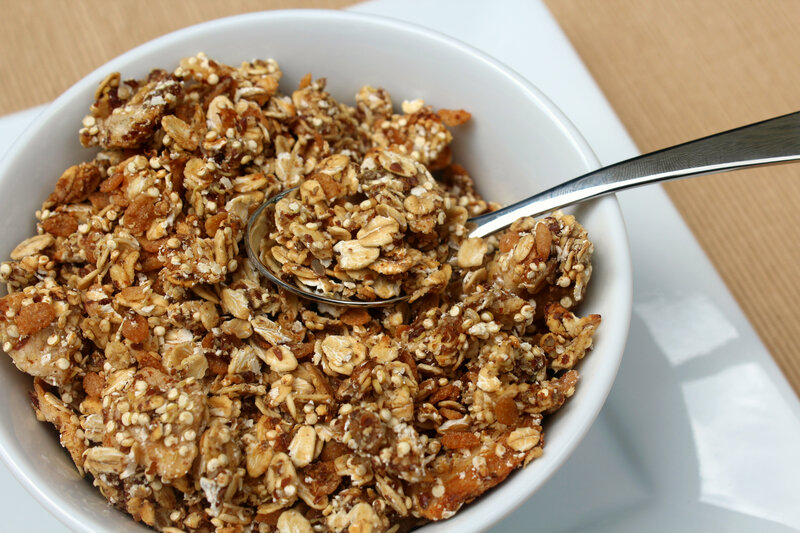 I used to love chowing down on the granola… But… It’s so calorie heavy that I would always eat WAYYYYYY toooooo much! ha ha ha! Well, good thing when I did this… It was the time of my life when I was competitively snowboarding so I was working out A LOT – Now, I cannot eat grains – BAH! Oats seem to have taken over the internet–especially if you’re vegan! I’ll be using quinoa way more often in my granolas now! I totally agree with veggies and spices! Spices for sure because they just MAKE the dish! I had no idea you could do that with Quinoa. I clearly need to spend more time on Pinterest. Ha ha! Lovely recipe, and so glad you shared it Rebecca! Haha, it gives it a perfect crunch and nutty flavor without the nuts! I have only cooked with wine a couple of times, but definitely need to get more adventurous about it. My step-mother used to make this amazing bourbon chocolate cake…perhaps I should start there. lol. Your granola looks delicious, I love that it has pears. pinned! Same here! And that sounds fabulous 😉 Booze and chocolate, haha! Always looking for new granola recipes. Have yet to add quinoa to mine so this will be added to my list! It was my first try with quinoa too and it has the perfect addition! Great recipe Rebecca! Elderflower liqueur sounds really interesting. I’ll have to splurge and try it sometime. I love vanilla extract, I even use it in my protein smoothies. I’ve never cooked with liqueurs either! This looks fantastic Rebecca. I came across your blog at the Gluten Free Diy Tuesday link party. Looking forward to having a look around. I love finding new blogs in link-ups too! Haha! This looks amazing! I was thinking the same thing as I read the recipe, a great gift granola! I love the peaches! I cook a lot with wine. I always have a few small bottles in the pantry! I think you mean pears haha?! I think I need to pick up some wine this weekend! oh man… I die! I need some of that vanilla! This is the best vanilla I have ever found! I seriously love just breathing in the bottle, haha! I’ve kinda have become obsessed with pear flavors right now, haha! wow this looks and sounds amazing!!! yes i agree with you on vanilla – must have the real thing!! Oooh yum! this sounds delicious Rebecca! I love things like this, and what a great combination of flavors! I have cooked with wine a few times, but I usually sub out vegetable stock for the wine.